This issue’s cover illustration is from Poppy and the Blooms by Fiona Woodcock. Thanks to Simon and Schuster for their help with this July cover. By clicking here you can view, print or download the fully artworked Digital Edition of BfK 225 July 2017 . When Hyacinth moves to London from her home in America, she was expecting changes but not the ones that she actually found. Getting used to the idea of separate taps for hot and cold water was very annoying but when she managed to get them to flow jointly Hyacinth did not expect to see ‘fire’ pouring out instead of water. Her elderly neighbour tells her about the magical rivers that run under London and how she has allowed a drop of magical water into the system and must retrieve it before midnight. So a truly unnerving adventure begins, but how can she recover the water and more importantly who can she trust to help her in her quest. This fascinating story mixes London history with magic and myths to produce a truly exciting adventure. The author has created a world that is so familiar we can even visit some of the sites that she mentions; yet they are also different, with a totally different underground world with hints of Victorian London. There are Golem type creatures called Saltpetre men and a giant pig called Oaroboarus who communicates using printed cards. The reader is quickly drawn in to this world and the fast moving quest that Hyacinth finds herself on. This story fits into the mould that we see in several other stories about ‘another’ London. They range from the Charlie Fletcher series to Tom Becker’s Dark Side stories. 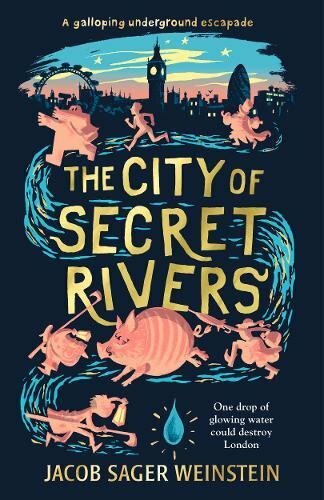 However this has its own very individual take on the idea and the use of London’s old historic rivers provides a wonderful opportunity to create a magical source, hidden from view since the sewers were built after the ‘Great Stink’ in 1848. The story also has another side to it; Hyacinth and her mother are in London because her father has left and her mother decides to return to her old home for a visit. There are questions about families and emotions that Hyacinth has to deal with and the trials that she has to go through help her to put her real life in to perspective. This is a great read for the confident reader and I hope that there will be more to follow.